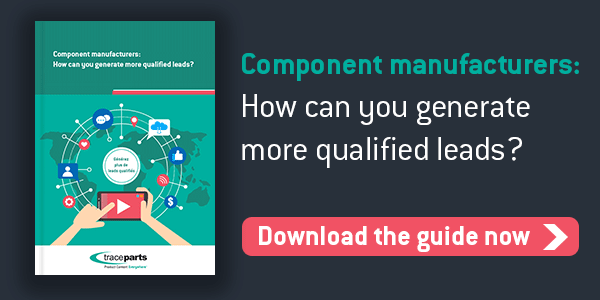 Home > Blog > Component manufacturers: how can you generate high-quality leads for your sales teams? A visitor who ends up completing a detailed contact form on your website becomes a sales lead. Even though a lot of the work has been done by this stage, the leads generated for your sales people need to be mature and qualified. In order generate high-quality leads, you should follow certain best practices. When it comes to generating leads for component manufacturers, quality is better than quantity. Although generating large quantities of leads for your salespeople may feel reassuring, the number of contract signatures will be higher if you generate fewer but higher quality leads. Your website content plays a crucial role in this. Indeed, if the messages that brought visitors to your site are not clear and engaging enough, you will not obtain high-quality leads. Proposals for partnerships or service offers, requests for internships all generate contacts, but these are useless for your sales representatives. Without going into further detail concerning the kinds of leads that are not worthwhile for your sales force, it is a waste of time attracting trade visitors to your website and obtaining their contact details if their needs do not fit your target. Make sure your website content is as clear as possible about your products and services and how you, as a component manufacturer, help your customers achieve their objectives. The professional accounts on social networks with the most common business applications – i.e. Facebook, Twitter and LinkedIn – represent billions of users. Your leads are among these users, somewhere online, just a click away from your website. With targeted presence among specialized groups dealing with your field of expertise, you have every chance of being noticed by your potential leads. Users will see you as an expert in your field if you have high-quality messages and interactions on social networks. The quality of your posts attracts qualified visitors to your website and in turn high-quality leads for your sales people. Targeted online advertising is a great way to make yourself visible to your target audience. Here, we are no longer reaching billions of contacts but millions or even thousands of qualified contacts. The number of contacts is lower but they are highly qualified. What could be more effective than a specialized partner who can publish your promotional content to millions of qualified business contacts in just a few clicks? To be sure that you generate high-quality leads when you implement your actions, it is essential you first analyze the results of your past actions. As a component manufacturer, you can optimize and replicate these to generate more leads for your sales people.